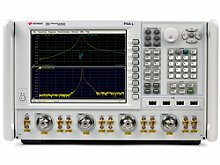 Keysight?s N5231A PNA-L microwave vector network analyzer (VNA) offers design and manufacturing engineers the highest-performance mid-range VNA. PNA-L is the world?s best value for microwave manufacturing with accurate S-parameters at a budget-friendly cost along with future-proof capabilities. The PNA-L family is designed for passive components and simple active device measurements of amplifier and frequency converters. Keysight?s PNA-L VNAs are available in five frequency models. Three frequency models, start at 300 kHz, with two or four ports available for the 13.5- (N5231A) and 20-GHz (N5232A) models, and two ports available for the 8.5-GHz (N5239A) product. The other two frequency models with two ports, start at 10 MHz, and include the 43.5- (N5234A) and 50-GHz (N5235A) products. The N523xA PNA-L VNA replaces and is 100% compatible with the existing N5230C, which means there is no change to your setup or test codes.